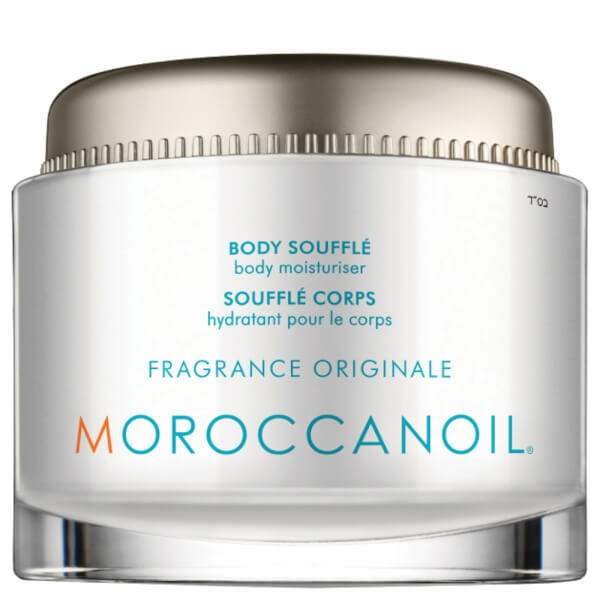 Treat your skin to the highly moisturising properties of Moroccanoil Body Soufflé, a lightweight, whipped body cream that absorbs quickly and deeply to provide intense hydration. Delivering immediate smoothness, the milky soufflé contains a cocktail of moisturising and antioxidant-rich ingredients, including Argan Oil, Shea Butter, Macadamia Seed Oil and Vanilla Fruit extract. Skin feels nourished and pampered. Aqua/Water/Eau, Caprylic/Capric Triglyceride, Glycerin, Macadamia Ternifolia Seed Oil, Glyceryl Stearate, Cetearyl Alcohol, C12-15 Alkyl Benzoate, Polysorbate 60, Isocetyl Stearate, Dimethicone, Myristyl Myristate, Parfum/Fragrance, Argania Spinosa (Argan) Kernel Oil, Butyrospermum Parkii (Shea) Butter, Hydrolyzed Oat Protein, Vanilla Planifolia Fruit Extract, Squalane, Honey/Mel/Miel, Ethylhexylglycerin, Ceteareth-20, Tridecyl Stearate, Hydroxyethyl Acrylate/Sodium Acryloyldimethyl Taurate Copolymer, Tridecyl Trimellitate, Dipentaerythrityl Hexacaprylate/Hexacaprate, Lauryl Myristate, Tin Oxide, Allantoin, Myristyl Laurate, Sorbitan Isostearate, Sodium Pca, Carbomer, Lauryl Laurate, Lauryl Palmitate, Sodium Hyaluronate, Palmitic Acid, Stearic Acid, Myristic Acid, Lauric Acid, Oleic Acid, Aminomethyl Propanol, Caprylyl Glycol, Butylene Glycol, Myristyl Alcohol, Cetyl Alcohol, C12-15 Alcohols, Benzyl Alcohol, Tetrasodium Edta, Potassium Sorbate, Sodium Benzoate, Phenoxyethanol, Mica, Ci 77891 (Titanium Dioxide), Butylphenyl Methylpropional, Linalool, Eugenol, Alpha-Isomethyl Ionone, Hydroxyisohexyl 3-Cyclohexene Carboxaldehyde.